THOSE who want to be among the first to see the rare dinosaur skeletons at the upcoming Lee Kong Chian Natural History Museum can now book tickets. 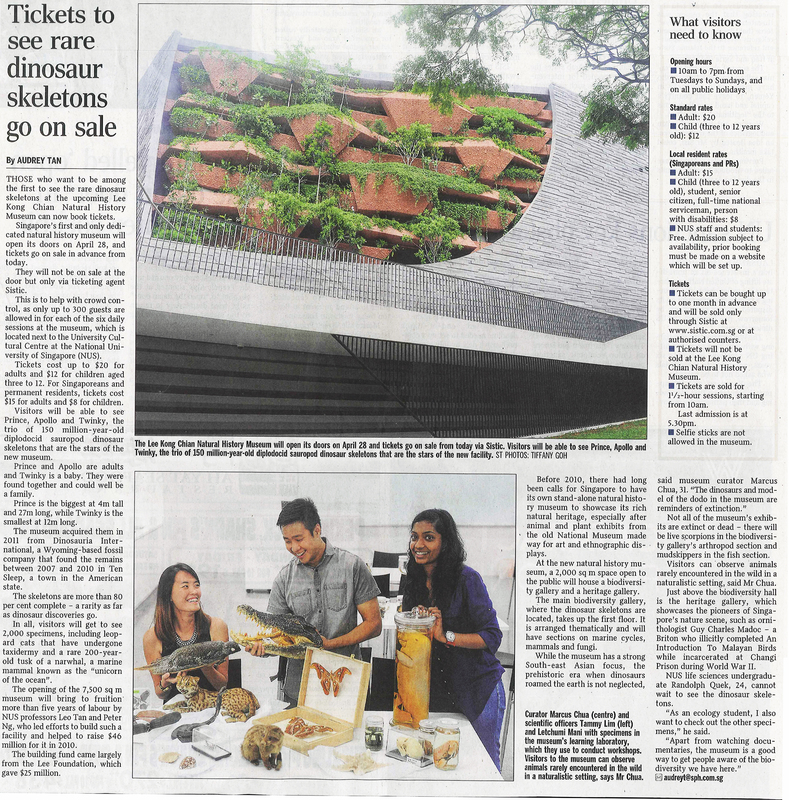 Singapore’s first and only dedicated natural history museum will open its doors on April 28, and tickets go on sale in advance from today. They will not be on sale at the door but only via ticketing agent Sistic. This is to help with crowd control, as only up to 300 guests are allowed in for each of the six daily sessions at the museum, which is located next to the University Cultural Centre at the National University of Singapore (NUS). Tickets cost up to $20 for adults and $12 for children aged three to 12. For Singaporeans and permanent residents, tickets cost $15 for adults and $8 for children. Visitors will be able to see Prince, Apollo and Twinky, the trio of 150 million-year-old diplodocid sauropod dinosaur skeletons that are the stars of the new museum. Prince and Apollo are adults and Twinky is a baby. They were found together and could well be a family. Prince is the biggest at 4m tall and 27m long, while Twinky is the smallest at 12m long. The museum acquired them in 2011 from Dinosauria International, a Wyoming-based fossil company that found the remains between 2007 and 2010 in Ten Sleep, a town in the American state. The skeletons are more than 80 per cent complete – a rarity as far as dinosaur discoveries go. In all, visitors will get to see 2,000 specimens, including leopard cats that have undergone taxidermy and a rare 200-year- old tusk of a narwhal, a marine mammal known as the “unicorn of the ocean”. The opening of the 7,500 sq m museum will bring to fruition more than five years of labour by NUS professors Leo Tan and Peter Ng, who led efforts to build such a facility and helped to raise $46 million for it in 2010. The building fund came largely from the Lee Foundation, which gave $25 million. Before 2010, there had long been calls for Singapore to have its own stand-alone natural history museum to showcase its rich natural heritage, especially after animal and plant exhibits from the old National Museum made way for art and ethnographic displays. At the new natural history museum, a 2,000 sq m space open to the public will house a biodiversity gallery and a heritage gallery. The main biodiversity gallery, where the dinosaur skeletons are located, takes up the first floor. It is arranged thematically and will have sections on marine cycles, mammals and fungi. Not all of the museum’s exhibits are extinct or dead – there will be live scorpions in the biodiversity gallery’s arthropod section and mudskippers in the fish section. Visitors can observe animals rarely encountered in the wild in a naturalistic setting, said Mr Chua. Just above the biodiversity hall is the heritage gallery, which showcases the pioneers of Singapore’s nature scene, such as ornithologist Guy Charles Madoc – a Briton who illicitly completed An Introduction To Malayan Birds while incarcerated at Changi Prison during World War II. NUS life sciences undergraduate Randolph Quek, 24, cannot wait to see the dinosaur skeletons. “As an ecology student, I also want to check out the other specimens,” he said. * NUS staff and students: Free. Admission subject to availability, prior booking must be made on a website which will be set up. * Tickets can be bought up to one month in advance and will be sold only through Sistic at http://www.sistic.com.sg or at authorised counters. * Tickets will not be sold at the Lee Kong Chian Natural History Museum. * Tickets are sold for 11/2-hour sessions, starting from 10am. Last admission is at 5.30pm. * Selfie sticks are not allowed in the museum. The Lee Kong Chian Natural History Museum will open its doors on April 28 and tickets go on sale from today via Sistic. Visitors will be able to see Prince, Apollo and Twinky, the trio of 150 million-year-old diplodocid sauropod dinosaur skeletons that are the stars of the new facility. ← Our first volunteer engagement tea! hi! when will the website for NUS students be up? can’t wait!